Okay here's a look at the gulls I see on this breakwater. Click on the picture to enlarge. 1,2 - These are first or second winter Glaucous Gulls. I know it's not fair, but you're just going to have to trust me on that. I was there. 12 - now, this is tougher. I know I saw Ring-Billed Gulls on that breakwater. Patrick left a comment below to that effect. However, I'm not sure I can find any in this picture. Look, I'm no gull whiz, but I'm stumped. 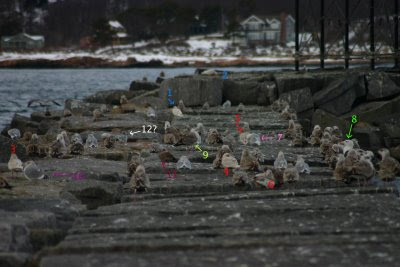 My best guess is number 12, which may be a dark adult Ring-Billed, but is more likely a Herring Gull. If you are better at gull IDs than I, weigh in. I'll admit that I was just guessing and assuming one of those distant gulls was a RB. I could go either way on #12. It looks smaller than the closest obvious Herring Gull, but I'm having trouble telling whether that's because of actual size or just extra distance. I think a better Ring-bill candidate in the original photograph is the third gull to the right of the Iceland Gull you labeled #4. It has a rounder head and thinner bill than the Herrings, and seems smaller than the Icelands. By the way, in the original photograph, there is a gull all the way to the left that appears to have a dark gray mantle and a smaller size than nearby Great Black-backed Gulls. Lesser Black-backed? This is the ultimate quiz for serious birders. They should have contests like this.